Trader Joe's has a new gluten-free cereal on the shelf: Crunchy Maple Ladders. 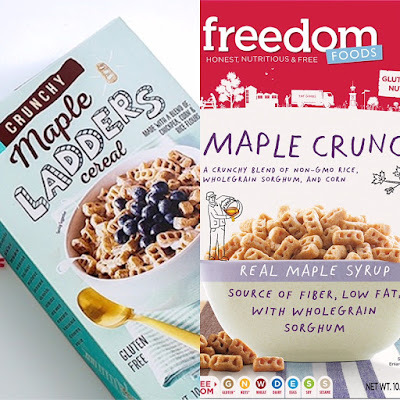 It's likely that the product is made by Australia's Freedom Foods, as the ingredient label pairs closely to the latter's Maple Crunch cereal. Sweet Loren's is expanding its line of gluten-free place-and-bake cookies to include Sugar, Fudgy Brownie and Oatmeal Cranberry, joining original Chocolate Chunk.The gluten-free varieties are manufactured in a dedicated facility. The company is offering a $1-off coupon at its website. Two of the four new LoveTheWild microwaveable seafood bowls coming this fall to Whole Foods, Wegmans and Target are gluten free. The Hawaiian Style Tropical Bowl and Baja Style Taco Bowl both feature barramundi, also known as Asian sea bass. 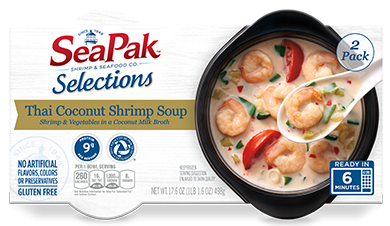 Among the new products added to SeaPak's Selections line is a gluten-free Thai Coconut Shrimp soup, available at select Walmart stores nationwide. After reading Tuesday's post about the new gluten-free stand at Citizens Bank Park, many readers commented via email and Facebook that they were less than impressed with the changes they encountered while attending games during the Phillies' recent home stand. I shared these views with Aramark and the company has decided to bring back the concourse-level stand-alone cart with dedicated prep area. 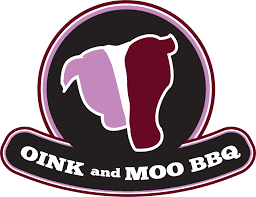 Stay tuned for the new location and menu options, along with a look at gluten-free options at MLB ballparks around the country. At Andale Latino Grill in Marlton (1041 Rt. 73 N.,609-535-3000) and Feasterville (144 E. Street Rd., 215-494-9505), the only non-gluten-free protein is the fried tilapia. Otherwise, gluten-free options include all bowls, tacos on corn tortillas, patacones and arepa sandwiches, and all sides (including chips and empanadas). Snap Custom Pizza, which offers personalized gluten-free pizzas prepared separately from their traditional counterparts, is now open in Bala Cynwyd (35 E. City Ave., 484-270-8636). DiBartolo Bakery in Collingswood (667 Haddon Ave., 856-869-3565) can bake gluten-free cakes, from strawberry shortcakes to Italian rum cakes to wedding cakes. Gluten-free cake layers are made first thing in the morning before traditional cakes and are assembled in a flourless area of the shop. All equipment and utensils are washed before gluten-free orders are made. Sprouts Farmers Market is coming to Philadelphia this fall with a location at 1000 S. Broad St. in the new Lincoln Square development. According to Philly.com, Shake Shack is opening a third Philadelphia storefront later this year at 1132 Chestnut St. at the former Philly Cupcake location. The New York-based better-burger chain has gluten-free burger buns.